EXQUISITE NATURAL ELEGANT UNIQUE! FRESHLY MADE TO ORDER AND BUDGET FRIENDLY. Sophisticated personalized/custom label with your choice of umbrella color, soap and guaranteed to ship on time for your event. I can make just about any size order you need. These soap favors are wholesale priced at $2.00 each with my unique & distinctive personalized labels. 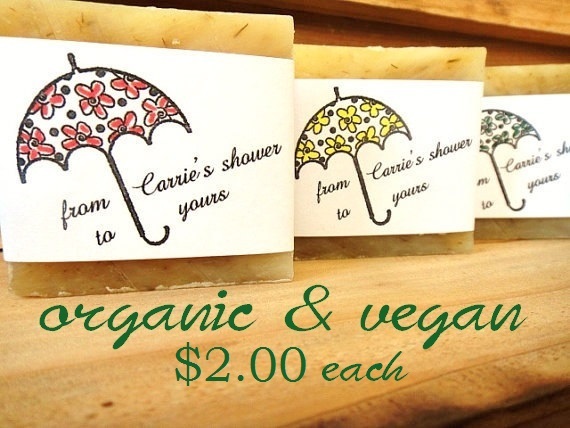 ALL SOAPS ARE NATURAL,VEGAN, & ECO FRIENDLY. This entry was posted in natural handmade soaps and tagged affordable favors, affordable wedding, all natural & organic soaps, artisan soap, bridal shower, bridal shower favors, bridal shower on a budget, bridal showers, bridesmaid, budget friendly, cold process soap, custom bridal shower favors, custom favors, custom label, detergent free soaps, eco friendly, eco friendly favors, how to bridal shower, maid of honor, shower on a budget, vegan soap, vegan soaps, wedding on a budget, weddings.